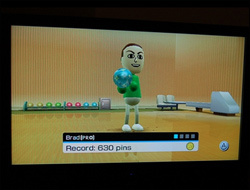 Everyone who plays Wii Sports wants to take the console home with them. It's the most intuitive and addictive game since Tetris. 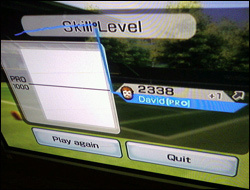 While playing Wii Tennis, at least one guest has come close to throwing themselves through the window with a rather overzealous backhand return. The tutorial videos on Wario Ware: Smooth Moves made me laugh chips out my nose. Mrsdiscopop-in-law got overly competitive on Wii Play's shooting range, making everyone a little more nervous on Christmas Day. If you like the internet smaller, blurrier, and more difficult to navigate then the Wii's Web Browser is the product for you. I completed Zelda in 50 hours, and was smug for approximately the same amount of time. Lots of people who are better at computer games than I will ever be posted their high scores to Flickr. Does the phrase "too much time on your hands" mean anything to the youth of today? The PS3 came out. Nobody bought it. We all laughed. Although it's a bit too early to claim victory for the tiny white console - especially as Nintendo can't get enough stock to the UK while the PS3 sits winking coquettishly at people on the shop shelves. Added to which - can we have some new games please, Nintendo?